Google’s Chromecast is branching out a bit: the company just announced Chromecast Audio, a dongle that promises to make it easy to stream music to any speaker system. Like the traditional Chromecast, the audio device works with iOS, Android and laptops to allow streaming to your speakers. Aside from a standard 3.5mm headphone jack, it can also push sound via old-school RCA and optical connections as well. Google touted how easy it is to cast content to the device, noting that it doesn’t require you to manually pair with the device each time you want to use it – you just need to be on the same Wi-Fi network. Even better, it can sync sound across multiple sets of speakers in your home if you want to turn your whole house into a giant sound system. It works just the same as the traditional Chromecast – including support for the same exact apps – so there’s no pairing process after initial setup. Once you connect, there’s a little notification sound informing you of the connection, and since it’s not a Bluetooth connection, there’s no worry about phone calls coming through your speakers. It’s a nifty take on the streaming dongle concept, making it easy and relatively affordable to stream music anywhere to your house, and add some extra life to your old ‘dumb’ speakers. The lack of Bluetooth pairing also makes it easy for anyone to join in and take control of the music. One last tidbit: Google also announced that Spotify is finally getting casting support, opening the doors for many potential new Chromecast users. 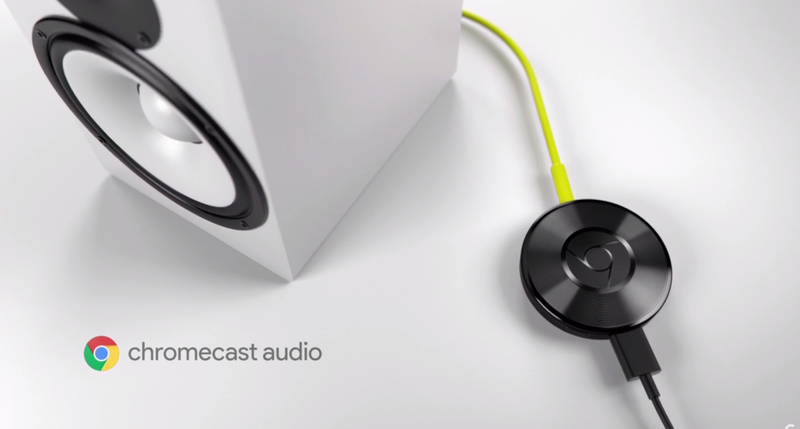 Chromecast Audio is goes on sale today via the Google Store for the same price as traditional Chromecast: $35. It will be available in 17 countries at launch.